…you reach down to pick off a brown thing and realize that the brown thing is the flower. It’s actually a pretty cool flower, but probably best described as interesting but inconspicuous, as half of them hide under the foliage. I’m just glad to see the plant looking happy. I bought it as a 2″ stubby, and it was miserable for a long time, until I stuck the pot underneath our flagstone bench and ignored it for a while. It’s one of the few California natives that genuinely seems to prefer deep shade, just start it off in really good soil but then completely neglect it. It’s currently in the group of container plants beside our front door, a spot that gets about twenty minutes of direct sunlight during the entire year. The brugmansia (I don’t remember which it is, one of the hybrids named after a person) is over six feet tall and wide growing in a 15 gallon pot, and it’s starting to insist that we put it in the ground somewhere. It used to do about a four month cycle where it would put out a bunch of leaves, cover itself with blooms, and then drop all of its leaves and start over, three times a year, as if it was an overachieving deciduous plant instead of an evergreen one. Lately, it holds onto its foliage better, but it only puts out a few blooms at a time, and it’s gotten thirsty. We don’t really have patience for thirsty plants that don’t produce food, so it’ll probably be moving on soon, even though the big green leaves have been great against the red building. There’s a Holodiscus discolor (ocean spray or cream bush) already in the ground there, waiting to claim the space for itself. It’s grown like a champion so far, thriving on the runoff from the brugmansia pot. Ocean sprays do well in deep shade and they look great from a distance, but I’m not sure it will be refined enough to be beside a front door. We’ll see. This entry was posted on Monday, April 6th, 2009 at 10:58 am and is filed under california natives, plants. You can follow any responses to this entry through the RSS 2.0 feed. You can leave a response, or trackback from your own site. I have grown Brugmansia as a conservatory plant before (and still think of it as a Datura!). The flowers were beautiful but it grew too big for the available space. A pity. 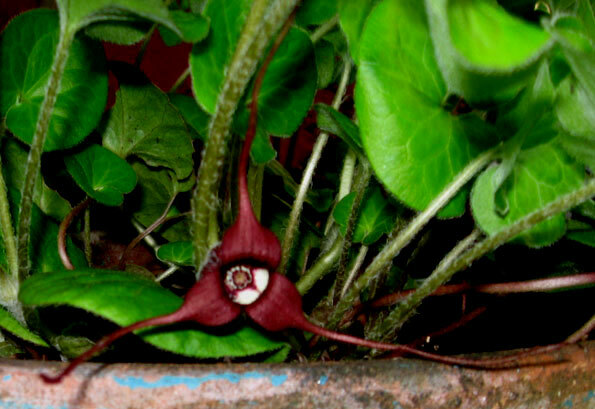 The Asarum looks interesting – I’ve got a soft spot for odd looking flowers. I’ve never grown asarums, though I’ve always thought the flowers were extra-cool. Thanks for the growing tips. 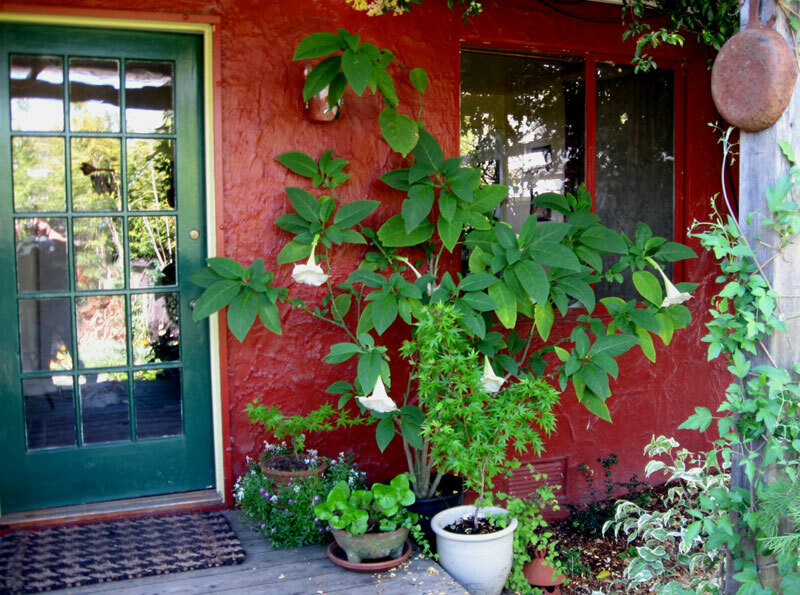 I agree that the brugmansia leaves look terrific against the red wall. The holodiscus won’t be nearly as splashy but should be a more manageable size. I’ll be interested to see what you decide to do with your entry. For me, that Asarum caudatum really takes off in winter. Divide it in December, and every rooted section will make a big new plant in just a month or two. Any other time of year, even with irrigation, it does nothing until winter, or craps out.